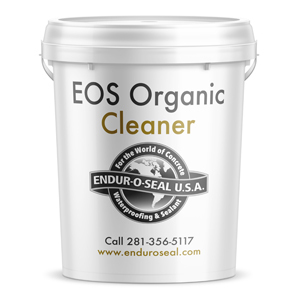 All Purpose EOS Organic Cleaner is formulated for removal of all organic matter. Eliminates all musty basement odors. All Purpose EOS Organic Cleaner is a water-based acid/oxidant that removes all organic matter such as Mold, Mildew, Fungus and Algae. It cleans off all organic materials and will prep (etch the concrete surface) a concrete surface for sealing and will not burn the brick or concrete matrix. All cleaned surfaces must be sealed to avoid re-growth. Use only a polyethylene or stainless steel containers and dispensing equipment. Apply by brush or low-pressure spray (30-psi max.) allowing 15 – 30 minutes for the cleaner to react with all the organic contaminants. Reapply and vigorously brush with a stiff deck brush. Do not allow the cleaner to dry on heavy growth areas. Rinse thoroughly with clean water. Exterior rinse may be done utilizing a high-pressure system (500-psi min.) Allow surface to dry and reapply if needed.